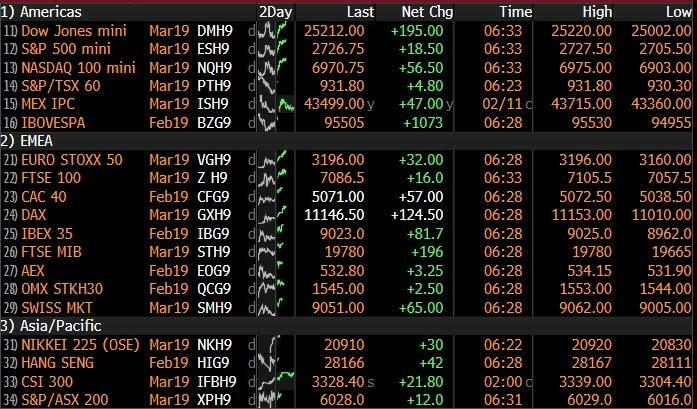 It's a sea of green in equity markets from Asia to Europe, with U.S. futures sharply higher following late Monday news of a tentative deal among American lawmakers to avert another government shutdown, while optimism about US-China trade talks rose after administration officials hinted at a meeting between Trump and Chinese President Xi "soon". Meanwhile, President Trump said "we are going to make great deals on trade" and don't want China to have a hard time. President Trump also commented that we probably have some good news regarding border deal but added he didn’t know what they meant regarding progress and affirmed the US would build the wall anyway. Japan's 10-year bond yields remained in negative territory even after the central bank cut purchases of some longer-dated bonds for the first time since July in a regular operation. The BOJ has sought to taper its purchases while focusing on yield targets rather than quantitative easing. Nissan reported worse-than-expected results. In fx, the dollar was mixed but held on to recent gains, having risen for eight straight sessions against a basket of six major currencies until Monday, its longest rally in two years. Although the Fed's dovish turn dented the dollar earlier this month, analysts - who were generally expecting a slump in the dollar only to be wrongfooted once again - noted the U.S. currency still has the highest yield among major peers and that the Fed continues to shrink its balance sheet. CHF/JPY - Another broad upturn in risk appetite has hit the safe havens hardest, understandably, with the Franc slipping closer towards yesterday’s overnight flash crash lows at 1.0091 vs 1.0095, and Usd/Jpy climbing to fresh 2019 highs circa 110.65 having breached 110.50 and the peak from 31st December last year just a pip or so below. Rebounding US Treasury yields are also impacting, and with no Japanese exporter supply anticipated before 111.00 where barrier defence offers are also expected, technical impulses could be more influential in the short term given a key Fib level and the 55 DMA in close proximity (110.54 and 110.59 respectively). NZD/GBP/EUR - Also conceding further ground to the Usd, with the Kiwi retesting support around the 100 DMA (0.6725) ahead of Wednesday’s RBNZ policy meeting that is widely forecast to culminate in a dovish hold (see our headline feed and/or research suite for a full preview of the event. Meanwhile, the Pound remains blighted by Brexit risk and related economic repercussions, as Cable teeters just above 1.2800 and a slightly deeper post-UK data low around 1.2834, with bids seen at 1.2820 and the 55 DMA at 1.2810. The single currency is consolidating off a fresh ytd base of 1.1258, but looking more prone to heavier losses while under 1.1300 and given little in the way of chart support ahead of the 2018 low (1.1216) apart from 1.1234. AUD/CAD - Defying the overall trend and both firmer vs their US counterpart, the Aud has rebounded firmly above 0.7050 and 1.0500 vs the Nzd with the aid of a more encouraging NAB business survey vs much weaker than forecast housing loans data. Meanwhile, the Loonie has drawn support from a rebound in crude prices and pared losses from 1.3300+ to circa 1.3270. 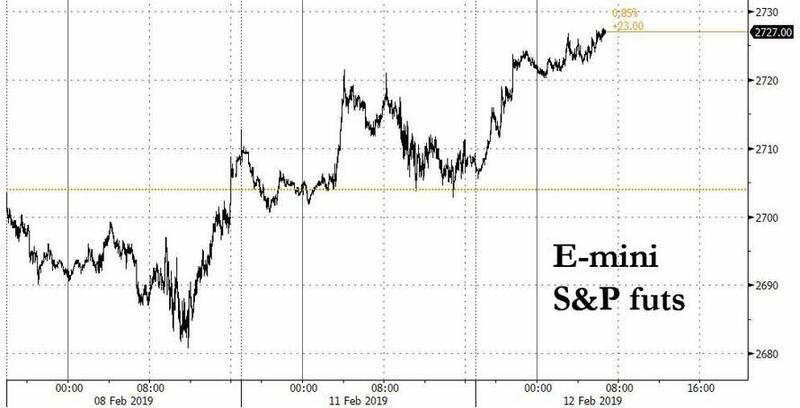 EM - Some respite for regional currencies against the backdrop of improved risk sentiment, and with the Rand also relieved to hear that Eskom is hoping to end power cuts by the end of the week – Usd/Zar back down below 13.8000. It might go under the radar but today is a bit of a landmark anniversary of sorts for financial markets. It’s the 20-year anniversary of the Bank of Japan cutting rates to 0% and the start of two decades of extreme monetary policy which the country has never been able to sustainably lift out from. A sobering template for Europe to worry about. Japan also kick started what became a more mainstream form of monetary policy post the GFC around the world. For economic historians Japan is really a fascinating case. If you took a snapshot of the nation’s finances and demographics today with no previous knowledge of the country’s journey over the last 30 years since its asset bubble burst, you would wonder how the country isn’t in a constant crisis. Debt to GDP is the highest in the developed world at 236%. The BoJ holds around 43% of all JGBs. 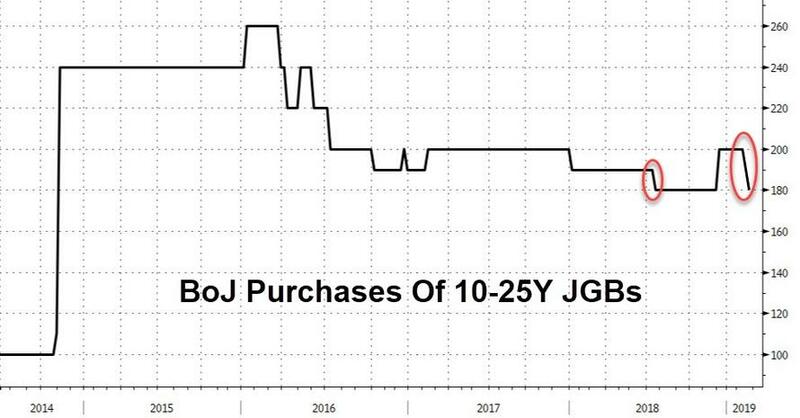 Core prices in Japan are also virtually identical to where they were 20 years ago and 10yr JGBs have fallen from 2.21% to -0.03% over this period. Nevertheless, Japan is an example of how long a crisis can be averted for under extreme measures. It also highlights how perceptions can be turned on their heads. Yesterday we found this quote from The Economist 20-years ago: "Without fiscal discipline, say Bank of Japan officials, the government risks losing control of public spending, inviting hyperinflation in the world's second-biggest economy." So, an unhappy anniversary today in many respects but it’s also noticeable that after 20 years of high fiscal spending the Japanese don’t have populism. Maybe that’s a message for Europe. Anyway back to markets where the S&P 500 closed a fairly uninspiring +0.07% yesterday. The NASDAQ (+0.13%) was a touch stronger if you’re looking for a shining light while the DOW (-0.21%) lagged behind. It wasn’t a lot more interesting in Europe prior to this where the STOXX 600 may have closed +0.85% but the reality was that it was just catching up to the late Friday rally on Wall Street last week. High yield credit wasn’t all that different where spreads in the US finished -2bps tighter while in bond land, Bund yields backed up +3.3bps to close at 0.117% - and therefore partially undoing some of last week’s rally which saw Bunds fall to as low as 0.076% at one stage and the lowest since October 2016. Treasuries (+1.9bps) were similarly weak (and are up another +2.7bps overnight – more on that below) while the curve – which has remained firmly rooted in a 14-20bps range all year – was flat at 16.6bps.